Actually, I haven't been too upset about the gulf coast. I'm confident it will be restored to health after the well is finally and permanently plugged, and that the businesses and people will be compensated fairly. There's no doubt that relying on fossil fuels causes damage. So does building houses, apartment buildings, and malls. So do wind turbines. So do nuclear power stations. So does allocating more and more crops to energy rather than food. There's just no simple answer to our energy needs, as we all know, or should realize. What we need to do is mitigate risks and downsides associated with all energy technologies, not merely point fingers. We also need to realize that risk, in any endeavor, will never go to zero despite our best efforts. Life is chock full of risk. Can we cure our “addiction to oil”? In five words, “not for a long time”. I read an article in the Washington Post that pointed out that if the entire U.S. soybean crop were dedicated to making jet fuel (assuming such a method could be perfected), it would only provide 20% of jet fuel. When I think about the miniscule percentage of our energy needs that jet fuel makes up, I realize how daunting the task is of switching to alternative energies. I also think about the many well-paying jobs Louisiana has enjoyed because of the oil industry. Our nation bemoans the lack of well-paying jobs at the same time that it imposes a moratorium on gulf drilling, which, if it lasts six months, may very well eliminate many thousands of those well-paying jobs. The moratorium makes no sense to me. I don't see why the government can't conduct the needed safety reviews without imposing a moratorium, unless, of course, it's the politics of scapegoating instead of leveling with the U.S. population. We can certainly choose to stop using fossil fuels this very moment, assuming people, not leaders of nations, have the will to do so. Of course, that won’t happen because people know we would end up with economies and living standards that are little better than those of the 19th century, when such things were not powered by inexpensive, easy-to-manage energy. And, when we say "we", do we mean the U.S., or all countries? The U.S. currently uses more fossils fuels than anyone else, but the largest increases are coming from developing nations. Should those nations freeze development? Living in Ecuador, I’m aware that this country is very proud of the fact that they have plans to build a new oil refinery and will soon be exporting gasoline to other nations. Yet, there are not many pollution controls here. The laws exist, so I’m told, but they're not enforced, no doubt because of the cost. One of Ecuador’s primary exports is roses. They are shipped all over the world, including to the U.S. – by plane. How else could they retain their freshness? Imagine the crippling blow that would be dealt to their emerging economy if jets stopped flying. Many people in the U.S. believe raising the price of gasoline there will curb usage. It will, as the high prices of 2008 demonstrated, but probably not nearly as much as they think, because there are no viable alternatives to gasoline and most people are not willing or can't afford to stay in or near their homes. The price of gasoline in Ecuador is about half of what it is in the U.S. Ecuador is still a poor nation. Price increases such as those called for in the U.S. would be very harsh here. So, do we cut back oil usage in the U.S. without having viable alternatives and give developing nations a pass as they continue to increase their fossil fuel consumption in a laudable effort to raise their standards of living? If so, how does that solve our overall energy problem? People will still have to drill, baby, drill. Rapid transit may help, but I can look at Austin's effort and projected plans and see that the help is very limited. And, if the project was subjected to a cost/benefit analysis, I doubt that any private business wishing to remain in business would have undertaken the project. Yesterday morning I received an email from Exxonmobil's PAC asking that I contact my congress people and ask them not to approve higher taxes on oil companies while not raising taxes on other companies. In part, it said, "The Administration's plan alone is to raise the industry's taxes by approximately $80 billion, including 'double taxation' on overseas earnings." I just checked and found the U.S. uses slightly less than 138 trillion gallons of gasoline a year. Why not add an additional 10¢/gallon tax on gasoline? That wouldn’t cause too much pain, would raise 13.8 billion dollars, and would avoid discriminately raising taxes on some industries and not others. True, it’s not 80 billion, but who in their right mind believes that higher income taxes on industries would not need to be passed onto the customer? Lawmakers are being disingenuous instead of levelling with the people. I haven't decided what to do about the request yet, but I tend to agree that higher income taxes on selected industries would be discriminatory. One point they made particularly caught my eye: "Contrary to claims made by industry opponents in the press, many are not aware that ExxonMobil's U.S. tax burden is already very large. Over the past five years, our U.S. tax bill was $63 billion, exceeding our U.S. earnings during that time by $19 billion." Of course, they survived this effective loss because the company earned more overseas than in the U.S. during the past five years. Is this propaganda or fact? Even I don't know. But I do know that when I worked there, Exxonmobil took pains every year to remind each employee to not take any actions that even remotely suggested that they were not following U.S. laws, as well as the laws of the country in which the employee happened to be working. My experience taught me the company tried hard to “do the right thing”. As you can see, I feel strongly that many people in the U.S. and elsewhere give oil companies a bum rap. The companies are doing what people want them to do – provide efficient energy. They do this in the most cost effective manner possible. Undoubtedly, mistakes will be made as they have to search for oil in increasingly challenging, even hostile, environments like one mile deep in the Gulf of Mexico. However, those mistakes will be rectified and punished, leading to even better methods of recovering oil demanded by consumers. Oil companies don't want these disasters anymore than the rest of us. It's an understatement to say that it's bad for business but, of course, it is. I get really tired of hearing people bash oil companies, including our president, when those same people continue to buy the product. I believe the next time people feel a need to point fingers concerning fossil fuels they should all be given mirrors. Today is a free day for a few errands and time for reflection. The Oregon group left early yesterday morning, a few with tears in their eyes. 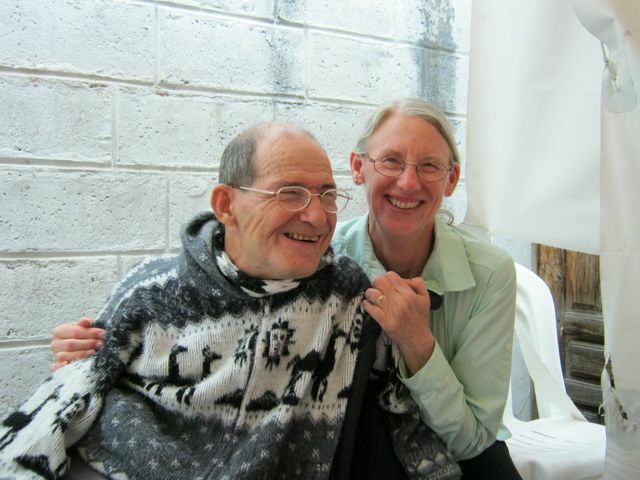 Glenn and I returned from Quito to Otavalo to find a day with no rain. So the weather has changed, maybe finally to summer. El niño has caused much unusual precipitation during June and July. Our visitors from the States and the three mission groups have all returned to their homes. And we too returned to what feels like home, our habitación at the Ally Micuy in Otavalo. Yesterday was a wonderful day to wash clothes and to hang them on the lines to dry. Today continues to be full of warming sun. 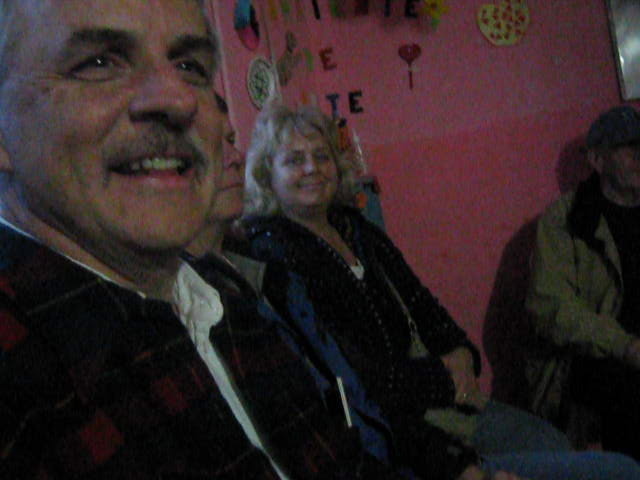 Here in Otavalo, FEDICE hosted two work groups: one from two churches in Austin, Texas; the other from six churches in Oregon. 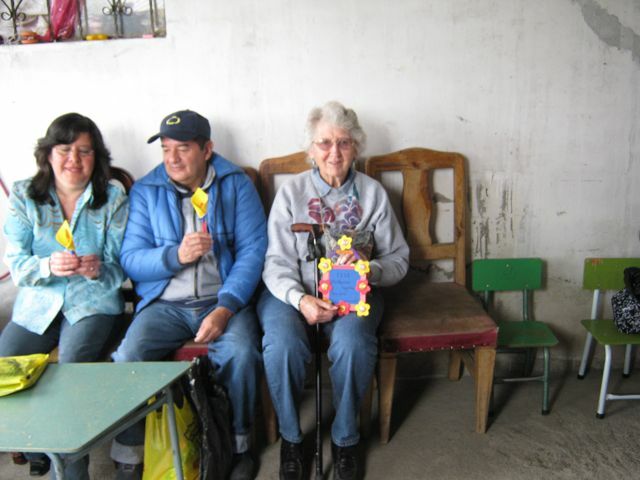 The third work group from Illinois stayed in Lasso, south of Quito, so we did not meet them. What was it like? We were busy..., very busy. My mother stayed for a wonderful 2+ weeks and saw many of our favorite outdoor places. 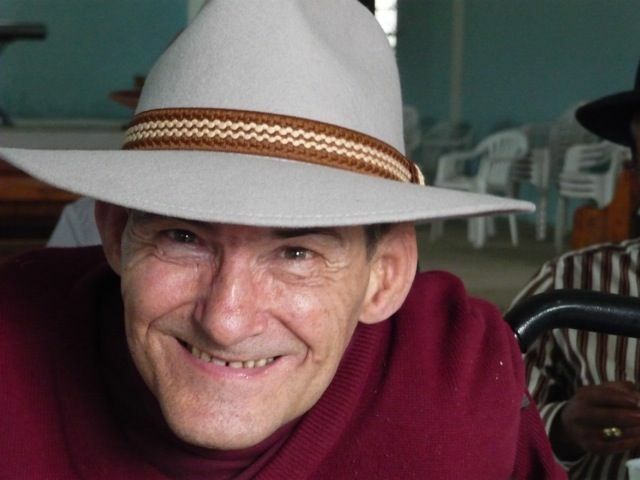 Austin stayed for 7 days, 3 of which were days to paint a sanctuary in a community called Cachimuel. 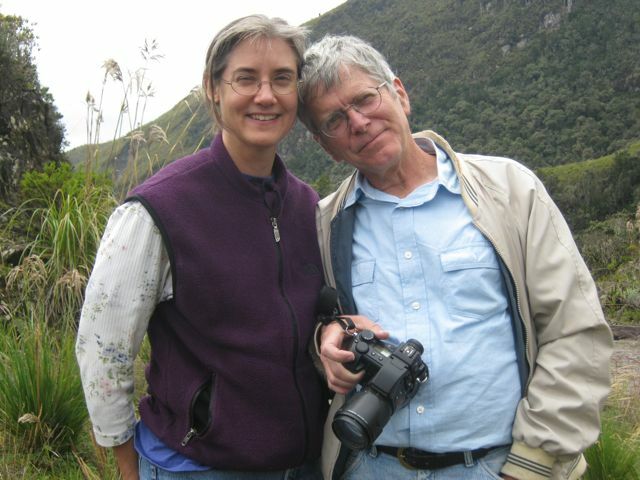 Amy and John were here only 2 days, but we were able to share el mercado, Laguna Mojanda, Cuicocha Lake, Rosalie Suaraz Helado, and fun talks together. 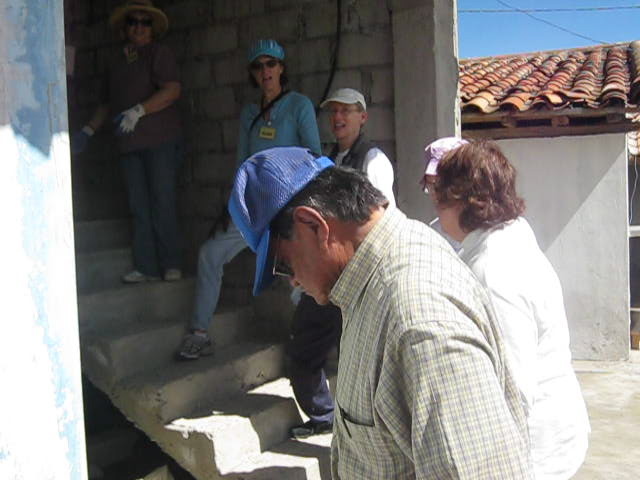 Oregon came on their heels and stayed 10 days, working extremely hard on a second story of the education building at a church in the community of Tocagón, as well as seeing projects they have helped fund in the Romerillos and San Francisco areas south of Quito. The groups were very different. Both were excited to be here, to explore this new (to many) culture and country. One showed Southern hospitality, was quick to welcome newcomers in their midst, was excited to play with the children in the community while sanding and painting. 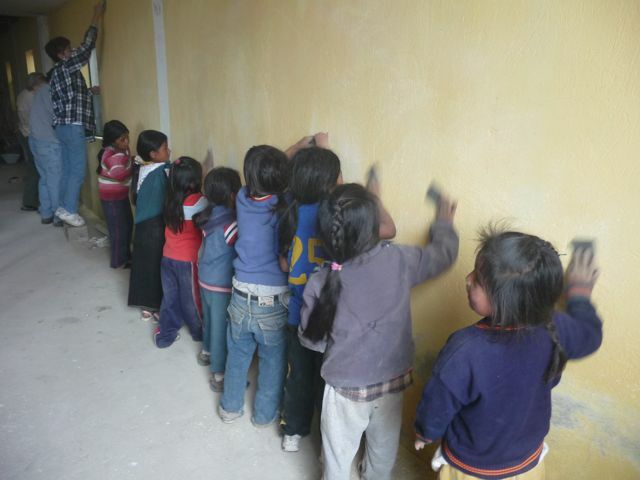 The other took awhile to get to know each other, gave a great 2-day vacation Bible school for the children, and worked their tails off carrying bricks and sand up flights of steps, sanding, painting, and laying concrete blocks. The communities were different too. One was warm and outgoing; the other was slightly disorganized but appreciated the help in a more introverted manner. Intense, communal living experiences always come with a need for flexibility and ability to roll with each day’s new challenges. Prayers over meals, evening reflections, and the limited sleep we all got helped to remind us of our different reasons for being together in the first place. For some it was to help make the community a better place; for others it was the adventure of meeting a new culture face to face; and even others liked the opportunity to search for God in the faces of the poor. Most individuals go home, somehow changed. Sometimes, the changes come after a period of time mulling over one’s experiences. Others are ready to share their experiences right away, hoping to build a fire in the hearts of friends and strangers to assist with the pains and sorrows of others. Yet, still others begin to see the need for justice and compassion within their own communities, having not noticed before. 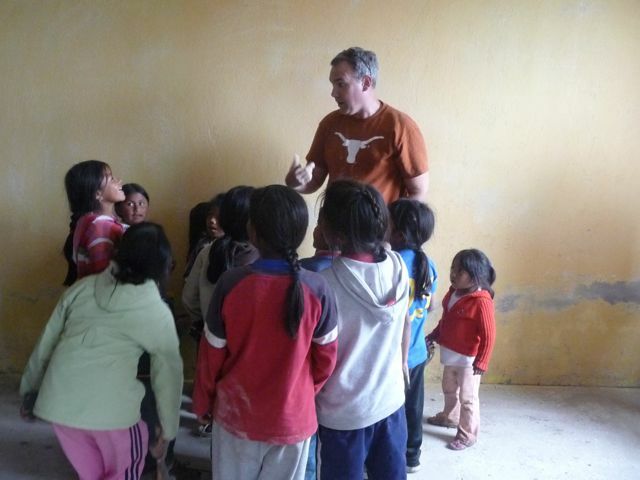 It is interesting what mission groups want from their experience in a “third world” country. 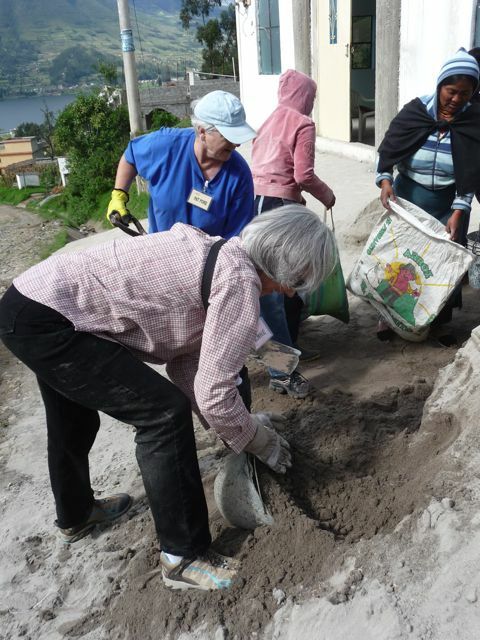 They appreciate being connected to a community where their funds help to make a better life for the inhabitants and their manual labor brings them closer to those they help. 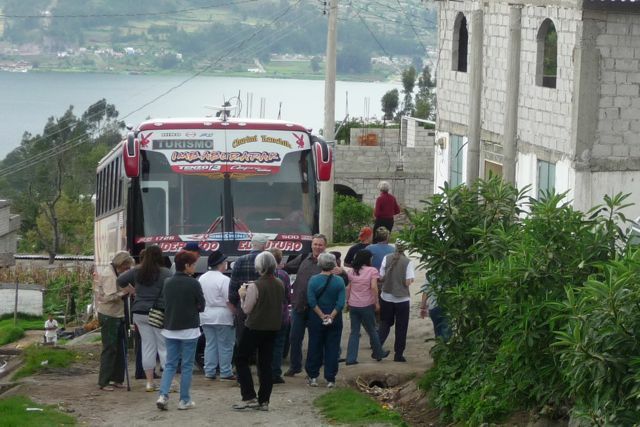 They also appreciate the guide service of being picked up and welcomed at the airport in the middle of the night and of being bused to various touristico sites. Having FEDICE choose good, but inexpensive hotels and restaurants is a very big plus. Yet, when something isn’t quite right, it is easy to become expectant “first world” inhabitants wanting quick and perfect fixes. When there is no hot water, when the hotel is a poor choice, when the music from the party next door keeps them up much of the night, oh how hard it is to not be a privileged Norte Americano. Fortunately, FEDICE only attracts the best of groups from the States with which to partner, and the groups allow only a minimum of unexpected experiences to bother them. 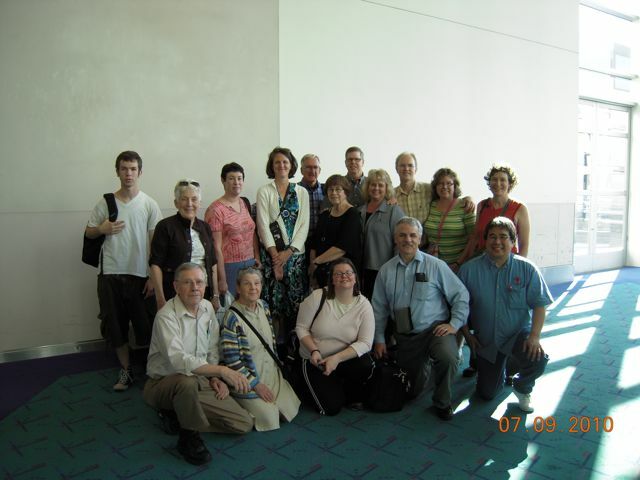 On another note, the group from Oregon does not consider the excursion finished when their planes touch down at various cities in their beautiful state. 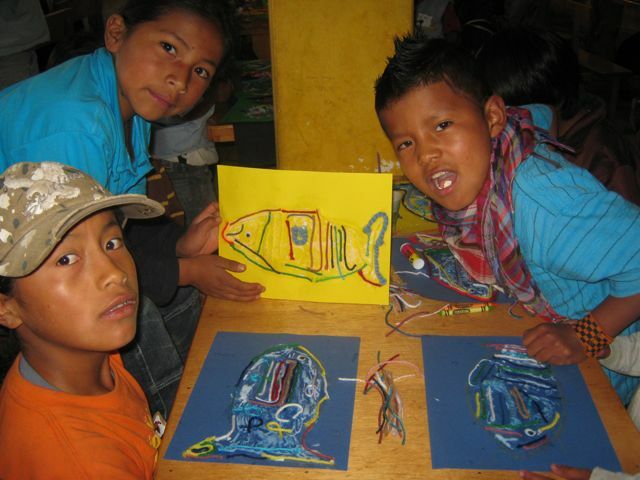 Then the goal becomes to let others know about their trip and the work of FEDICE, to encourage others to get involved in FEDICE through donations or future work projects, and to view the world and those in it as our brothers and sisters. What a great impact they make! As Global Ministries has had to decrease their gifts due to lower contributions to various service organizations like FEDICE, worldwide, the Oregon Region Christian Church, Disciples of Christ has raised $20,000 a few years ago for FEDICE and is currently on a campaign to raise $39,000 for FEDICE. 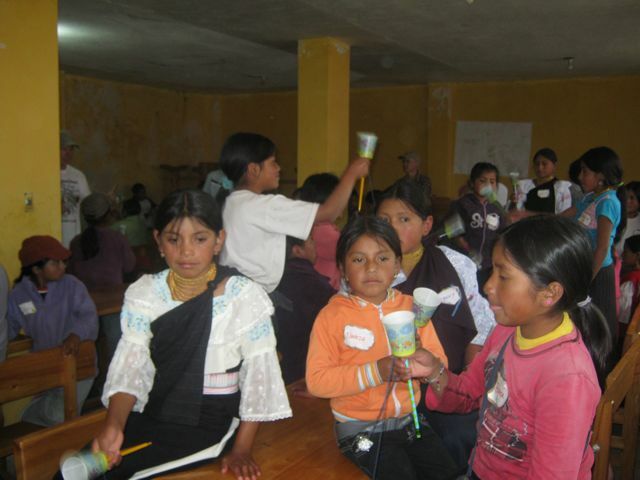 Their funds have helped many marginal communities in the mountain regions of Ecuador to begin bringing their men back from the cities to live with their families. By loaning small amounts of money to individuals to raise chickens, guinea pigs (a local food favorite), goats, pigs, and cows and to provide training on how to raise these animals in a healthy way, mothers have been better able to provide a living for their children, making it possible for the men to come home from the cities where they were working. More families are now able to make a living from the land, where they can live together. Who would think such a small thing as training and a loan of $180 could make such a difference? So all is well with us here in Ecuador. We are so proud of our fellow Norte Americanos who shared their time and resources with communities here, who loved the children just because they were children, who loved the people just because we are one people in this world, who share because it is the thing to do. We are glad to live our simple lives as we too are learning better to share our time and talents with others, as others share with us. And I’m happy to report the sun shone all day upon us.